From energy from the ground to the energy of the theatre. “Tra Terra e Cielo” (Between the earth and the sky) the festival in Pomarance, a small town in the province of Pisa, was established six years ago. This year for the very first time, the event will be extended to include the council areas of Castelnuovo Val di Cecina and Monterotondo Marittimo and will be called Festival delle colline geotermiche (Festival of the Geothermal Hills) and is taking place from 11 July to 27 August. The event confirms the area’s deep relationship with the land and with Enel Green Power, its sponsor and the manager of the world’s oldest geothermal complex. On 30 July Plant 3 in Larderello, where one century ago experiments were made with the first generator, will host a theatre performance. A cult show dedicated to Camillo Olivetti, the pioneer of information technology in Italy: the story of the non-conformist genius will be told through the words of Laura Curino and Gabriele Vacis. On 28 July another Enel Green Power plant, the Boffetto hydroelectric plant in the province of Sondrio, will be the stage for a concert as part of Ambria Jazz (2 July-18 August), the Valtellina Music Festival in its ninth edition and this year dedicated to the bicycle as a gentle and clean form of transport. At the Boffetto plant the Artchipel Orchestra and the Via Padova Orchestra will be performing “Batik Africana Suite” and the Paolino Dalla Porta Future Changes Quartet will perform “Moonlanding”. 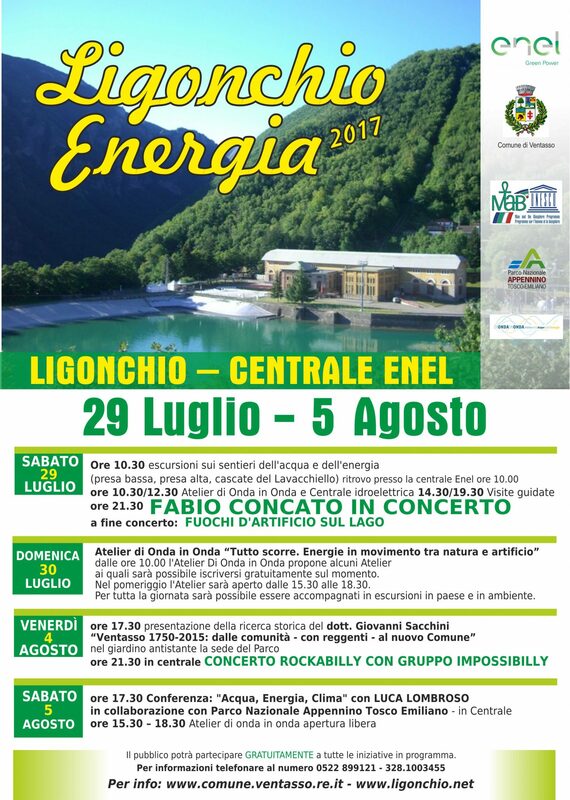 Also on 29 July, a concert by the singer songwriter Fabio Concato will open Ligonchio Energia, a festival of events dedicated to the theme of water, held in the Enel electricity plant in Ligonchio in the province of Reggio Emilia. In the morning the plant will host the Atelier dell'acqua e dell'energia (Workshop on Water and Energy), a scientific-educational event about the physics of water and the production of electric energy, created thanks to a collaboration with the Apennino Tosco-Emiliano National Park, the University of Modena and Reggio Emilia and Reggio Children, the foundation partner of Enel Cuore in the project Fare Scuola. On 5 August, meanwhile, will be the conference “Water and climate change” with the participation of expert Luca Lombroso. Another event not to be missed is on 29 July in Formazza at the head of the Val d’Ossola valley. 100 historical photos from the exhibition “Uomini Macchine Dighe” (Men, machines, dams), which appeared at the Milan Polytechnic as part of the first Festival of Sustainable Development organized by Asvis, will be projected onto the walls of the historic Enel dam in Morasco. Onto the large concrete wall that is 55 metres high and 575 metres long will be projected the series of images illustrating the story of the endeavours on the very limits of heroism that enabled the construction of the large dams and power plants in Italy during the last century.